Blame it on public school, but I will always have a serious love for the weekends and summer. Don't I work every weekend? Well, yes. Isn't summer in the Midwest sweltering and at times miserable? Mmmhmm. It doesn't matter, though. I look forward to every weekend and I treat every summer like it's pure magic. Went for coffee (and juice). Had some ice cream... maybe more than once. ;) Hey, there are a lot of delicious places to choose from. 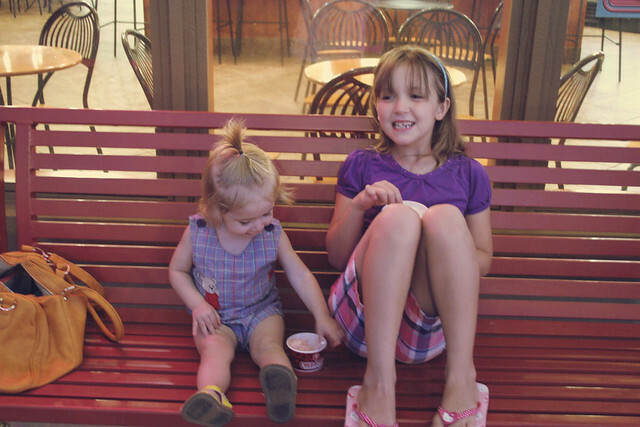 Met the SWEETEST blog reader who totally impressed Hope with her ice cream flinging (literally, in the air) skills. Hi, Grace! We also went swimming, but I don't have any pictures of that since my arms were wrapped around a splishy-splashy baby. I hope your week is starting off in the best way! Looks like an awesome week! And this Postrgram? Sounds amazing! I must check it out now! Oh my goodness, the poster is amazing!! I think I will have to bookmark this!! It will make an amazing gift for my friends who are soon to be engaged! They would love one of them! Sounds like you guys are having a wonderful summer break so far!! Just a tad jealous sitting here on a cold winters night! And your daughters are such cuties! I am in love with that poster! What a beautiful poster. Loved the photo of you before, but this is just amazing!! OMG, that poster of you is amazing!!! I definitely have to check that easy shop out, thank you for sharing! 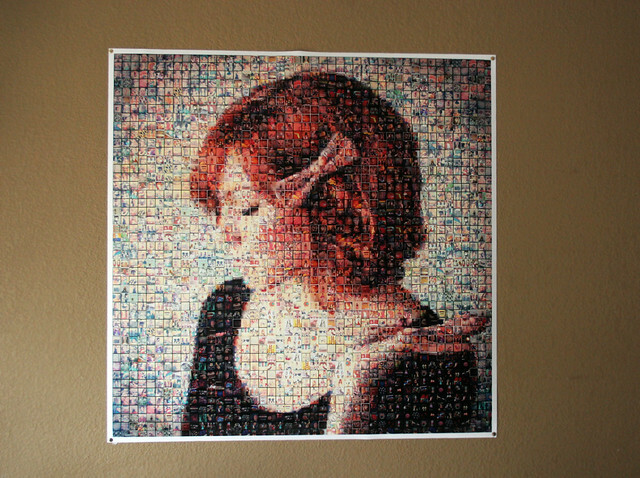 we did one of these for my mum for her 60th - its so much fun looking up close remembering all the little moments! Amazing moments, I love how you spend so much time with your family and raise your daughters so fine! These are the times they will remember you for...and these are the times that count the more for them! love ice cream & coffee... those coconut donuts look delish!! and that instagram poster is pretty awesome! i cannot get over this. it's awesome. and what a perfect shot. you are stunning! cheers. Donuts are a weekend tradition around here too! :) And that poster is so awesome! That poster idea is amazing! That must have taken a lot of work to put together. So cool! First you made me want donuts and then you share that amazing pic. I need one. Of everything. 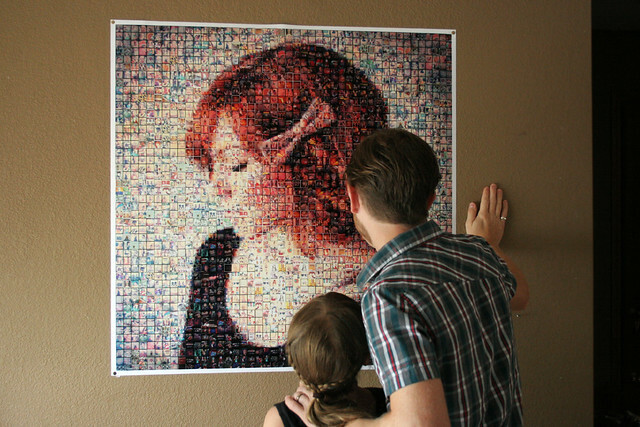 That portrait made out of Instagrams is FABULOUS. That instagram poster is SO pretty + amazing!! That poster is amazing! Wow. That instagram poster is so cool and what a lovely idea. I would love to put all my instagram photos somewhere they are some of my favourites. I should really get them printed out. that poster is unbelievable! such a nifty idea. 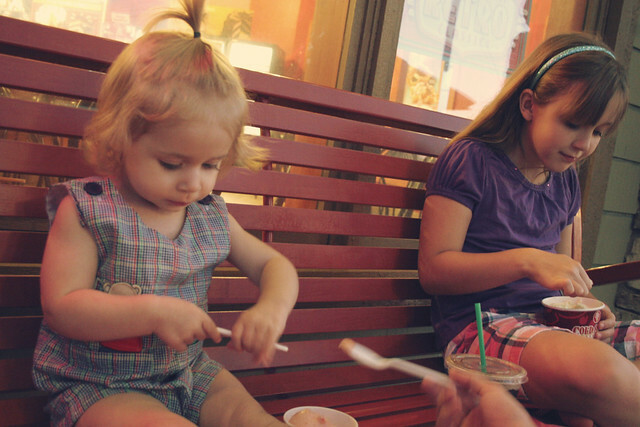 and weekends with more than one ice-cream trip are always amazing, haha. The poster is very cool, but is it weird staring at a giant picture of yourself? That picture is the most awesome thing. You could stare at it forever. It's like doing a where's waldo. The poster is very awesome! I'd probably stare at it forever too,just looking at all of the different pictures. Also,your glasses are too cute! I don't think I've seen them before (are they new?). Have a great Tuesday,girl! PS. Ice cream on a hot day is the best! Beautiful poster! Adorable kids:) Have a Great summer! Sounds fun! Mmm...donuts! Might have to steal your tradition cause that sounds amazing! Those donuts look so good. (Can you tell I'm hungry?!) Kind of fixated on the donuts. Oh man that Postrgram is amazing, what an interesting way to display your photos! Also I totally have a craving for ice cream now! 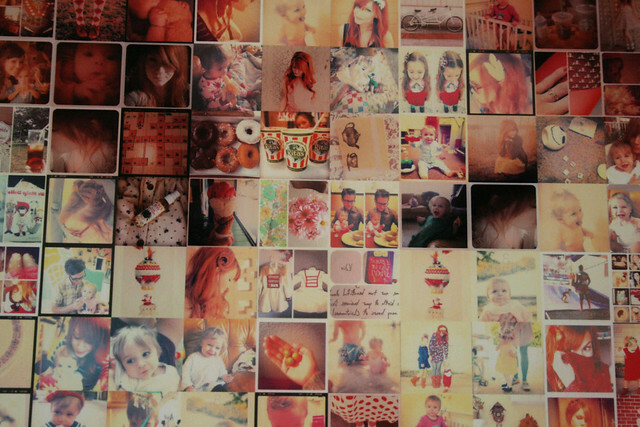 Wow, I would love to get a Postagram with a picture of my little one. That is such a cool use of instagram photos! Wow, that poster is incredible! 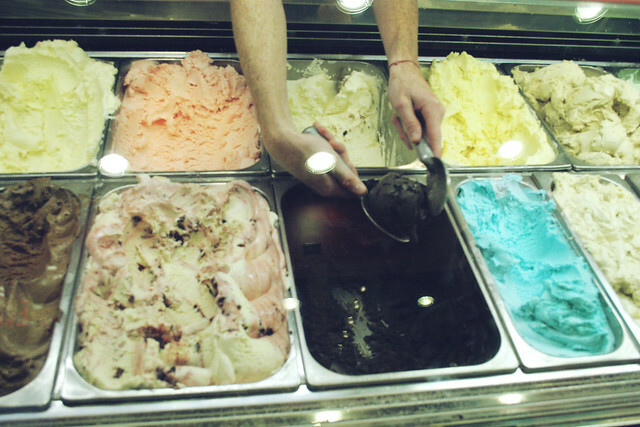 And the ice cream looks so delicious. Summer is the best! It looks like you had a wonderful week! Oh my goodness! That poster is so amazing! I love it! That poster is amazing and so beautiful! Hey thanks everyone! My wife and I own Postrgram. It is awesome to see so many people like it! katie! thats amazing! i love the postrgram! definitely on my wish list. will get taking more photos!! love this post too! sweet weekend! Postagram...really?!!! That is amazing. I could spend hours looking at something like that. And it really makes it easy to put a whole lot of art on the wall...lol!! sounds like a marvelous weekend! That picture is awesome! That poster-I can't even fathom how that is possible?! SO COOL! Love the last picture, they are in awe too it seems! looks like a wonderful weekend! where do you work on the weekends? also coldstone is one of my faves. i get an oreo overload without the chocolate chips with a brownie instead, all in a waffle bowl. and i wonder why i can't lose weight! this is wonderful! I love your blog layout and I love your pictures. And man, that shop is amazing. Oh boy. Those donuts look amazing. I'm not a huuge fan of donuts but I could certainly make an exception for those!!! And that instagram photo thingo is amazing. Also, just wondering where you got your glasses?? That's just the coolest poster EVER! that portrait is absolutely amazing. i cant even begin to understand how they did it. it's perfect! Beautiful! What a lovely post. I agree about summer being magical. I think its all the water you get to swim in! looks like you had an awesome week-end! and btw, that poster is amazing! this is the most amazing poster ever!! love iiiit! Those donuts look so scrumptious! What an amazing poster, how creative! Sempre que possível visito seu site (que por sinal é lindo), sou apaixonada por suas criações. That poster is amazing! 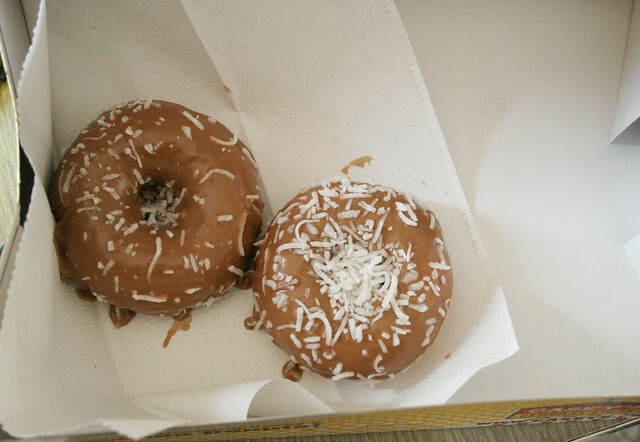 And those donuts - yum. Now I really want one. I really love your blog (following you now). that poster is amazing, and a wonderful gift idea. that instagram photo collage is brillant! Wow that poster is amazing! Poe makes the best faces. I totally love that postergram - it's awesome. I can't even imagine how hard that was to make. oh, Jesus! this picture is adorable!! !